Happy Saturday everyone! I have just a quick post for you today. This card is for my 2nd sneak peek for Ethereal Forest Designs. I hope that you have been visiting everyday this past week because there have been some amazing cards and projects posted by the team. This is Jewel Planting and also features Garden Sentiments. The store opens Monday and these awesome images will be available for purchase. 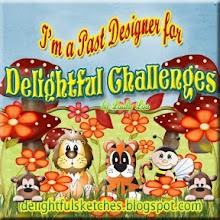 I followed the MyGrafico Challenge Blog sketch this week designed by Mary Vogel. The base is white card stock followed by a layer of fabulous paper that I received in a card kit. I colored Jewel with Copic markers and then inked the background with Distress Inks (Broken China) to create a soft sky. Matted it to Real Red card stock that I decorated up a bit with a Martha Stewart border punch. Welcome to Inktegrity's Spring Hop! You probably just visited Laura Jean's blog. If not, the entire blog hop is listed in order below. This is a celebration of the awesome Design Team and all of you who create with Inktegrity! All of these images that you see on our blogs were created by request of each member. Along the hop, there is a letter for you to collect - no need to unscramble as it is spelled out for you. Simply email the phrase to jonjinko@hotmail.com with the phrase in the subject line and she will email the freebie image to you. In addition, be sure to leave a comment on the Inktegrity blog (the last on this hop) so that you are eligible to win your choice of 5 of these images!!! I have always loved unicorns. As a kid, I collected them. Many have been lost from my collection over the years, but some very special one's remain. When Joni asked us to request an image I had to give it some thought but then ultimately decided on a unicorn when my oldest son had asked me what my very favorite book of all time is. Of course, it's The Last Unicorn by Peter S. Beagle. Thinking of the book and reminiscing about the wonderful characters, Lady Amalthea (the unicorn), Molly and Schmendrick, Prince Lir, King Haggard... *sigh* We were also asked to name our image - my son Levi named the unicorn Harmony. When Joni sent me this image you have no idea how delighted I was! I set to work, mentally, on how I wanted my card to look. At first I was thinking the colors of how the film The Last Unicorn looked, but then after a trip to the ribbon outlet, my color scheme shifted to burgundy, white and ivory. The base is Baroque Burgundy and then I cut the "top note" die - not the SU! die, but one I created in SCAL and then embossed with the Textile Cuttlebug folder. I colored the image with just a touch of color using a Copic Marker (B0000) and a Prismacolor Marker (Cream). The with a blender pen and Baroque Burgundy ink, added a touch of color to the mane. I have truly enjoyed my term on the Winter Inktegrity Design Team. I want to thank Joni for having given me that opportunity. I am sad to leave but I am excited to see what the Spring Team will bring. It's also been an absolute pleasure to work with everyone on the team. Now you can continue on to Guest Designer Dawn's blog to see another special image. Thank you so much for coming by! Good Morning! We're on the downhill side of this week, so I hope it's going well for you. 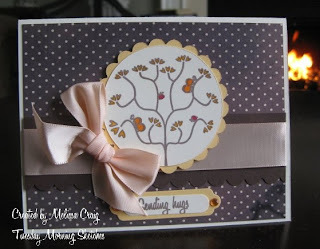 I couldn't get enough of Lindsay's new set, Birds and Branches, so I have another card to show today. I also followed the sketch from The Pink Elephant. The only draw back was, I did A LOT of cut-work on the branch and then I ended up covering most of it up! Still, it's a pretty card. I had just gotten this paper from AC Moore the other day, so I was very excited to use it. It works perfectly with the card. I embossed a piece of Chocolate Chip card stock with the Birds & Branches (I think that's what it's called) Cuttlebug folder. I colored the image with Copics and then finished it off with a piece of linen thread for the hanging part. Be sure to visit Lindsay and the rest of the team - they are sure to have something amazing to show you. Thanks for stopping by. Good Morning! I hope you're having a SWEET week so far. Arlana has another fabulous sketch for this week and we have a sweet sponsor, too. MyGrafico joins us this week as the sponsor and we received a very cute digi to play with, too. I recently had the great fortune to be on the design team for the MyGrafico Challenge blog, so it's fun to "be back." Fun sketch right? There is so much possibility with this sketch - but that's true for all of Arlana's sketches. Here's my take on the sketch. When I was given this image to use, I knew right away that I wanted to keep it clean and simple and for a small child's birthday card. The card came together rather quickly. I colored the image with my much neglected Kohi-noor pencils and OMS. I don't do bright colors very well, so I going with the pencils gives me bright with a safety net. I added black ribbon with a white grosgrain ribbon to sort of create a road. I hope that you join us this week. Please go over to Sweet Sketch Wednesday so you can play along, gets lots of inspiration and eye candy and have some fun! Thank you for stopping by! Good Morning! There's a new challenge over at Tuesday Morning Sketches and it's not a sketch. This week is a COLOR CHALLENGE. I gotta shake things up a bit every now and then! The colors we're working with this week are Light Orange, Dark Brown and Ivory. Or translated to SU! colors, Always Apricot, Chocolate Chip and Very Vanilla. Our sponsor this week is a new stamp company based out of France, InfinimentScrap. I am very thankful to Isabelle and Adeline for sending me stamps to play with - I had fun! The image I used is a beautiful tree with the sentiment at the bottom. You can see the image here. 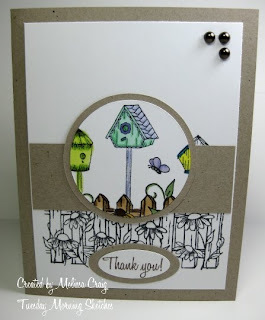 I did follow a sketch from Sunday Sketch & Stamp challenge blog. This is a new one to me. I loved the sketch. I colored the image with Copics, the paper is from Making Memories and the ribbon came from my stash. I hope to see you over at Tuesday Morning Sketches. And throw in another challenge if you want to! Thanks for stopping by. Good Morning! Happy Monday. I hope you're week is off to a great start. I have a very exciting announcement. I have been asked to join the design team for a new company called Ethereal Forest Designs. 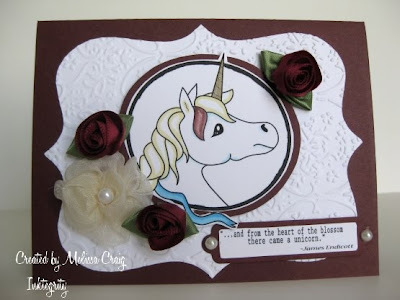 Our lovely team leader Darsie kicked off the sneak peek week yesterday with her gorgeous card featuring Marble the Unicorn. I am thrilled to be a part of this team and am very excited to show you my card. This is Elymira and she's so cute, she'd cheer anyone up. I created an easel card, portrait orientation. Most easel cards are in landscape orientation, so it took a little figuring on how to make it the other direction. I am very pleased with how it turned out. 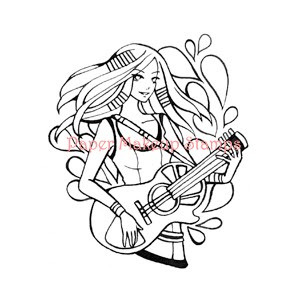 I printed Elymira on Neenah Classic Crest Solar White card stock and colored her using my Copics. I pulled out some old SU! patterned paper (can't remember what it was called) and then kept my colors to the same as the paper. I topped the card with chocolate brown ribbon, but it looks black in the photo. I need more lighting when I take my photos or better photo editing software. I really wanted to repeat the flower that she's holding, so in my photo-editing software, I cropped out the flower and did a little clean up and then imported the image into my word document and resized to different sizes. Then added the sentiment and printed. I had to do a little more touch up with a pen, but the results are pretty good. What I did was more like when you color on a rubber stamp with a marker to only ink up parts you want and omit other parts - just digitally. I printed a larger flower and cut Elymira out to create the stopper for the easel card. 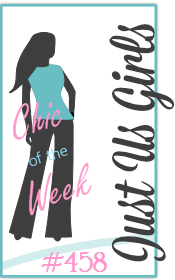 I hope you enjoyed this sneak peek and that you visit Ethereal Forest Designs every day this week to see what the other girls have in store for you. You are going to love it! All digis will be available on March 1st. Hi there! Happy Gabby Day! I am so glad that you've joined us to show support to our beloved friend Gabby! If you arrived here from Sheri's blog, then you're on the right track. If not, please start at Joni's blog. 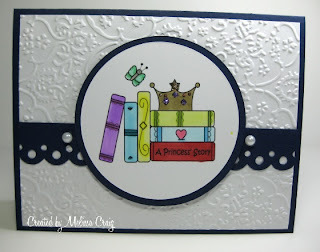 I am honored to be a part of this blog and to help celebrate a very talented stamper who constantly amazes me, has inspired me not only through her crafting but by her positive and supportive nature. I am very lucky to have her on my design team for Tuesday Morning Sketches, but am more honored just to be able to call her my friend. I used an image from Lindsay's Stamp Stuff. I used a white card stock base. 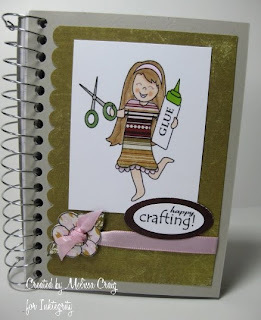 My next layer is Pale Plum that I embossed with the Spots & Dots Cuttlebug embossing folder. I colored the image with Copics and Stickles. I created the sentiment with a font called Scriptina and then added the stars around it. I punched it out using the SU! tag punch and then pulled out an old tool... the Magic Matter, to create a mat in black. This digi-image was created especially to help the Arriaza Family. Click on it and you'll be re-directed to Paper Makeup Stamps where you can purchase it. All proceeds will be donated to the family. There are a couple of coordinating sentiments available, too. 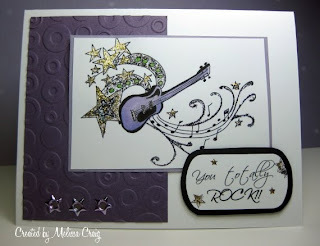 Thanks so much for joining us for the Project Rockstar blog hop. Your next stop on the hop is our very own DJ - Cheryl. Have fun! Good Morning! It's another Thursday with Lindsay - Lindsay's Stamp Stuff. I don't know if I've ever said this, but I am absolutely blessed by being able to design for this wonderful lady! She's so sweet and so generous. I am honored to be a part of this team (and the other teams that have graciously extended me the offer to join them). I am excited to get to share with you a new set that she's released this week. It makes me feel like Spring is definitely coming. 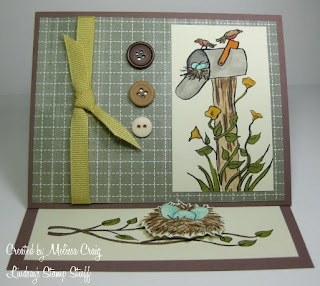 I made this card for my monthly card group, too and I was so excited to see the different elements in this new set, Birds and Branches, and that they worked so well to create an easel card. Here's the front and part of the inside of the card. I even pulled out some more old patterned paper to create my card. 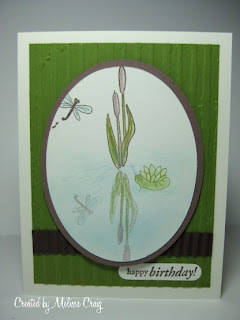 I used some from Spring Flowers (I think that's what it was called) from Stampin' Up! over my Close to Cocoa base. I colored the images with Copics. I added some mustard yellow grosgrain ribbon and three buttons to finish off the front of the card. I printed the bird's nest and layered onto another piece of card stock to give it some stability, cut it out and then pop dotted it onto the card to be the "stopper" for the easel. Here's a view of the inside. I added a text box above the branch to put in my sentiment. 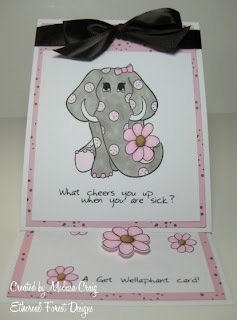 This card went together in minutes - I love it when that happens! Please be sure to visit Lindsay and the rest of the team because I'm sure they have amazing cards and projects to share with you. Thank you so much for stopping by! Good Morning everyone! I hope you're having a sweet week so far. It's still very cold here and the kids are home again today. It's time for Sweet Sketch Wednesday and Arlana has a fabulous sketch for us to use. But when does she not have a fabulous sketch? We also have one of our regular sponsors joining us this week. I had a fabulous time playing with Coco again. This bear set is just one of the sweetest sets ever! I used paper from the Citrus mat stack from DCWV. I colored the image with Copic markers, the flower is something I found in my stash. It's amazing what I find when I take the time to look! I used the Martha Steward heart border punch and then finished with a sentiment from There She Goes stamps. 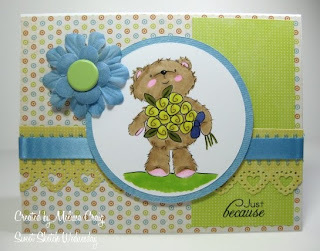 Be sure to visit the Sweet Sketch Wednesday blog so you can play along, too. 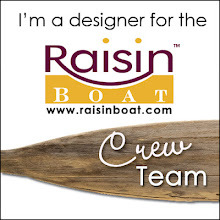 Visit the Design Team, they have some wonderful things to share with you! Thanks so much for stopping by. Good Morning! So much for sending my kids back to school today. They'll be home today and tomorrow due to the continued snow and they're still digging out school buses. They'll be taking summer school at this rate. Well, in other news, over at Tuesday Morning Sketches, we have a new sketch, a new sponsor, an exciting new feature and it's a judged challenge week. 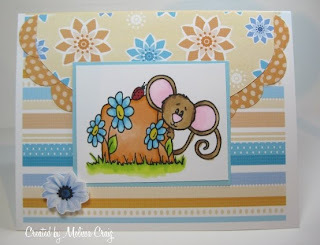 Tracey from The Stamping Boutique is joining us this week with her adorable digi-stamps. I am very thankful that she sent some images to me and my team to play with. This image is so adorable. It's called First Dance and this young couple is too adorable. My sketch didn't yield for me to use the entire image, but you can see it here in The Stamping Boutique shop. It is so sweet! The base is Brocade Blue, I chose it to match the boy's blue jeans and then added a bit of purple and Bashful Blue to pull in the girl's dress and apron. Instead of adding another layer of paper, I drew a frame around the circle focal image and added some hand doodling. I am pretty happy with the overall effect. I hope you join the team and I this week. I'll see you over there! Good Morning! Happy Monday! I am thrilled that I have my kids home with me one more day today, but I think everyone is hoping that they can go back to school tomorrow. The roads are getting pretty good, the buses should be OK. They've had an 11 day weekend! Joni with Inktegrity has done it again! She's releasing a new digi-set today. I just love this image because it's the epitome of us all. I don't know about you, but I love notebooks. I have 2 or 3 by my computer at all times. I use them to write down notes or draw sketches that I want to try. I find they are very useful when I've figured out measurements or come up with some tips to simply jot them down in my notebook. So when Joni sent us this image, it was perfect for one of my notebooks. I've had one sitting on my table for months begging to be dressed up. I used paper from a Basic Grey pad that I've had for ages. Joni purposely left her dress plain to allow for paper piecing. The base is Sahara Sand. Then I printed her on Neenah card stock and colored her with Copics. I also printed her out on the patterned paper for her dress. 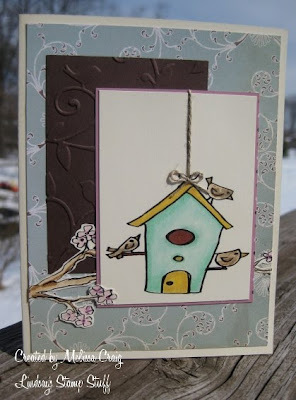 I used the ribbon slide stamp from DRS Designs to finish it off. It is paper pieced as well. Let me give you a tip on how you can accomplish this printing without having to print twice. If you haven't seen my tutorial, you can click here to view that. I have developed another way to do it and will do an updated tutorial soon. Thank you so much for stopping by today. I do enjoy your visits. Good Morning! Have you ever visited The Sweet Stop challenge blog? I love this blog, I don't get to play as often as I'd like, but I do visit every week. There is a new challenge every Saturday. 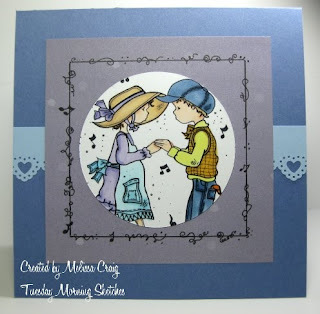 This challenge blog is an entity of Sweet n Sassy Stamps. I saw the sketch yesterday and knew I had to make time to play along. Such a great sketch! I received Peek-a-Boo Cocoa for free and I've been eager to play with this adorable image! The sketch was perfect for this image. My card is digital, too. I got some free digi-paper from Two Peas yesterday and I love the Spring hues! The striped paper I sized so that the pattern is continues on the back of the card. The flower is digital, too! I just cut it out and added it on with a pop dot. I colored Cocoa with Copic markers. This was such an easy card to put together, but it seems to just go like that when you've got a great sketch and great supplies to work with! I hope you play along with all the sweet Sugar Babies this week. I had a blast! Thank you for stopping by and I hope you have an enjoyable rest of your weekend. Hi Everyone! Thanks for coming by again. I have something very special to share with you (I hope this works). As most of you know, my sister is in her 2nd year of being Breast Cancer free, so the awareness of this horrible disease means a lot to me. I also have friend who I was very close to in Jr. High & High School just recently get back in touch with me via Facebook. While we were catching up I learned that her mother lost her battle with Breast Cancer. This video brought tears to my eyes and I just want to share it with. Don't wait until October to Think Pink... this awful disease doesn't. Good Morning! Happy Saturday to you. I'm hoping we continue the sunshine we've had the last couple of days so the roads get cleared off. The kids really need to get back to school. The monthly card challenge group I belong to had a challenge to create a reflection card following a tutorial found on Splitcoast Stampers (here) and I knew right away which stamp set I wanted to use... just about the only one I have that would make this technique a little easier to do. 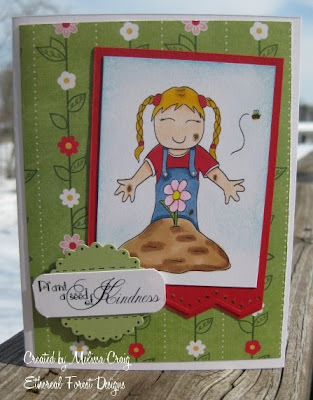 I used Pond Pals from Sweet n Sassy Stamps. 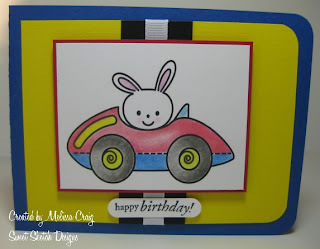 I am also joining in another challenge found at Charisma Cardz Challenge to create a masculine card. I am pretty pleased with these results. I hope you like it, too. Thanks for stopping by! Good Morning! I hope everyone had a great week. We've got a bit of cabin fever going on. I actually got to play with my stamps today and do a couple of challenges. Today I played with Truly Scrumptious (sketch, button & bows) and ColourQ (Regal Rose, Blush Blossom, Close to Cocoa & Chocolate Chip). I pulled out some oooold stuff, too, to make this card. I used a stamp from the Fall Kit from All That Scraps. I colored her with Copics and Prismacolor Markers. The paper I used is from Petal Patch that is about... what? 5 years old? I even dusted off (literally) my crimper for the Chocolate Chip strip in the center. I was really happy that RV13 is the perfect match for Regal Rose. I had a lot of fun playing today - perhaps my creativity is finally coming back to me. Let's hope so! Thank you so much for stopping by and I hope you join the wonderful ladies at Truly Scrumptious and Arielle at ColourQ for a couple of really great challenges. Good Morning everyone! 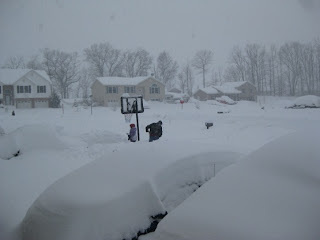 We're still buried under quite a bit of snow. Ugh! I have a really easy gift bag to share with you today. Easy because it's available as an SVG, so with SCAL and the Cricut (and a bit of sizing for the baby bug) it was cut in a minute and ready to put together! If you don't have SCAL or a Cricut, it's OK because it does come in a printable format so you can print it and then cut it out. I cut the bag from Night of Navy card stock. 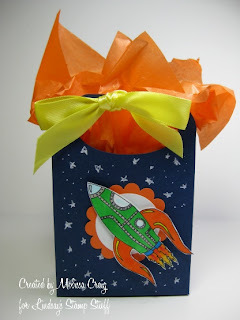 I used the Rocket digi-stamp found in Lindsay's shop and colored it with bright colors (Copics). After I put the bag together I decided it needed stars. Take a tip from dummy me - draw the stars on before you put the bag together. Then I just added a bit of orange tissue paper and a bright yellow ribbon. Lindsay is offering another sale! 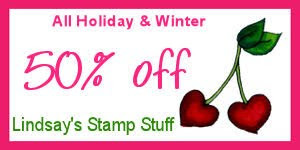 All Holiday, including Valentines Day stamps (sets only) are 50% off! Click on the sale banner to go directly to her store. 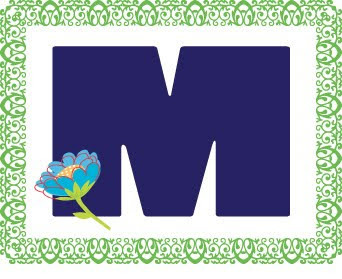 Or if you're already shopping at MyGrafico, the sale is valid there, too! Be sure to visit Lindsay and the rest of the team to see what they have to share with you this week. Thanks for stopping by! Good Morning! 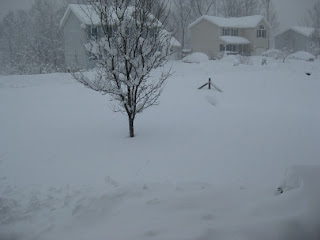 Well as promised, the snow started yesterday and it's too early to go look out now to survey the damage. At least we got a mail delivery yesterday. We didn't get one Friday, Saturday or Monday. What ever happened to: "Neither snow, nor rain, nor heat, nor gloom of night stays these couriers from the swift completion of their appointed rounds." Guess they don't do that here! It's Wednesday and Arlana has another great sketch for us this week and we have a sweet sponsor, too! Elizabeth from Soft Pencil is joining us this week and if you've not seen her images before - they are in two words: very sweet. I was lucky enough to have won a challenge where the prize was $15 worth of her adorable images, so I was very excited to use one for this sketch. Awesome, right? So much potential! Here's my card. Can you tell I am dreaming about Spring? I love this image and I was really excited to get to use some other things with it to pull this card together. I colored the image with Copics and then lightly sponged Distress Ink, Broken China around it to create a subtle, cloudy sky in the background. 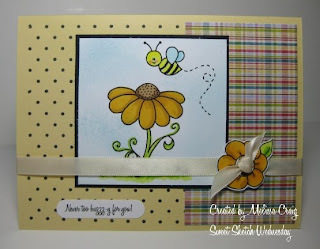 I used a Barely Banana base and then stamped the polka dots using PTI's Polka Dots Basics stamp set. The plaid paper is digi-paper that I got from A Cherry on Top. The flower is a ribbon slide that I have never seen these anywhere but at DRS Designs. The sentiment is computer generated. Be sure to go over to the Sweet Sketch Wednesday blog to get the details on how to play and see what Arlana and the rest of the uber-talented team did. Thanks for stopping by! Hi there! Thanks for coming back to visit me today. 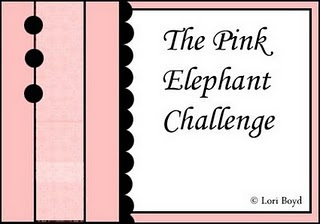 I am super excited to be joining in the blog hop fun to celebrate The Pink Elephant's 1st Birthday! Now if you're here just because you like visiting my blog, thank you very much! But if you want to do the hop, start at The Pink Elephant. It's a big one so be sure you have a favorite beverage and kick back to enjoy the fun. You do have until Thursday, Noon EST to finish it. This is TPE Sketch #9 and it's such a great sketch! Here's my card. I didn't stay completely true to the sketch - I didn't add the 3 embellishments. I tried, but it just didn't work for me. I used Neenah card stock as my base and then I pulled out some old, very neglected supplies from PaperTrey Ink. I used Lemon Tart as the next layer. I used a piece of black Bazzil Basics card stock and my SU! Scallop border punch. I then wrapped a piece of Summer Sunrise polka dot ribbon (PTI) around the black border and then tied in a simple knot. 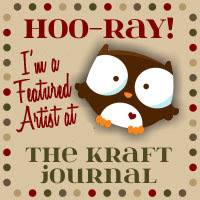 I used one of the new stamps from All That Scraps, it's one of the stamps that was included in the new Spring Kit. Oh my word, she is A-DOR-ABLE!! I colored her with Copic markers. 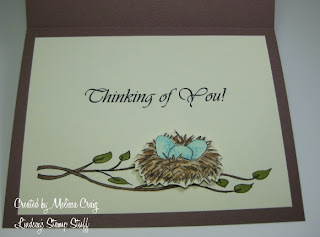 I did try to add a sentiment and the 3 embellishments and they just didn't work for me - so I kept the card rather simple. I hope you enjoyed my contribution to the hop. I appreciate your visit. Your next stop on the hop is Mary S. I hope you enjoy the rest of the hop! Good Morning! The kiddos are home today and happily still snuggled in their beds. I sure hope the heater repairman can get to us today. It's not that we're freezing, but we do have to get up every so often throughout the night to either turn the heater on or off. 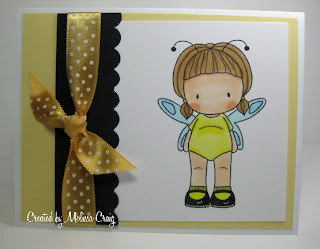 My card today features this week's sketch challenge that's on my challenge blog today. We have a wonderful sponsor this week, DRS Designs joins us! So here's my card and I have to laugh at myself. We were generously given 2 stamps to play with and when I chose my stamps, I was looking at the wrong sketch. I chose stamps that would work well with LAST week's sketch, so this week's sketch really knocked me for a loop! But after I thought about it, I decided I could make it work. Make it simple and do the spotlighting technique. I really like the simplicity of my card and it's earthy feel. 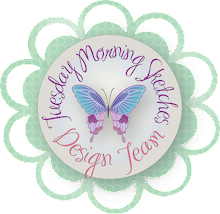 I hope you join us over at Tuesday Morning Sketches for a great challenge and a super sponsor! 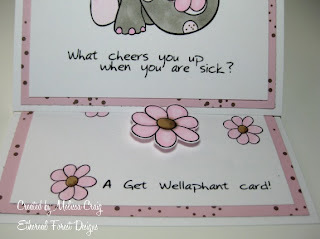 And and stop by later, today is the The Pink Elephant's 1st Birthday Blog Hop. It starts at Noon, EST. Good Morning Everyone! I hope your weekend was good. We got hit with about 3' of snow so the kids are home for the next couple of days and the city continues to dig out... just in time for more snow on Thursday. Today's card is using the image that was designed by Joni of Inktegrity. This is the fundraiser digi that you can purchase for $3, the proceeds will go to the CJ's Thumbs Up Foundation. All pertinent links are in the side bar. Inktegrity is sponsoring Card Patterns this week, so here's my take on the sketch. I do hope you'll take a minute to purchase this adorable stamp. It helps out a great cause. Also, there's still time left to get Wally the Whale for free with a $5 purchase. Hurry, offer ends on the 14th. This is the back yard. The fence line is almost gone and it's a 4' fence! 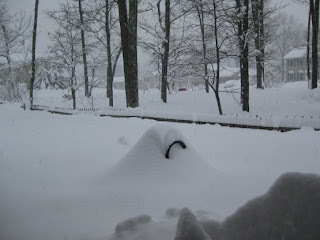 That lump is Woody's car - mine is next to it. Beyond that is two of our neighbors trying to dig out. Our front yard off to the right of the front door. 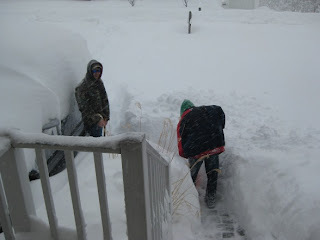 Woody and Brendan... that's a whole lotta snow! And it's still coming down! And wouldn't you know it - this was the weekend the furnace decided to give out. Urrrgggh! !